Payton is a 4th year Economics major from Redondo Beach, California. He joined EWB because he was interested in joining a club that made an impact in helping other people while using skills learned in the classroom. His favorite memory from EWB is the first club camping trip he got to go on during his 2nd year. Outside of EWB and the classroom you can find him fishing in Morro Bay or hiking Bishop's. Originally from Colorado, Marta is currently enjoying her fourth year at Cal Poly. She decided to get more involved with EWB her second year and is so glad she did! Some of her favorite EWB experiences include being a design lead on the Thailand team, volunteering with IMPACT, and traveling to the United Nations headquarters in New York for the Science, Technology and Innovation Forum. During her free time, Marta loves exploring the outdoors in any season. Jennifer is a second year mechanical engineer who hails from Lincoln, a town north of Sacramento that contains more cows than people. She joined EWB because it combines her passions for technical problem solving and providing corporeal assistance to other people. Outside of EWB, she enjoys reading and spending time at Laguna Lake with her dog Rhaegal. 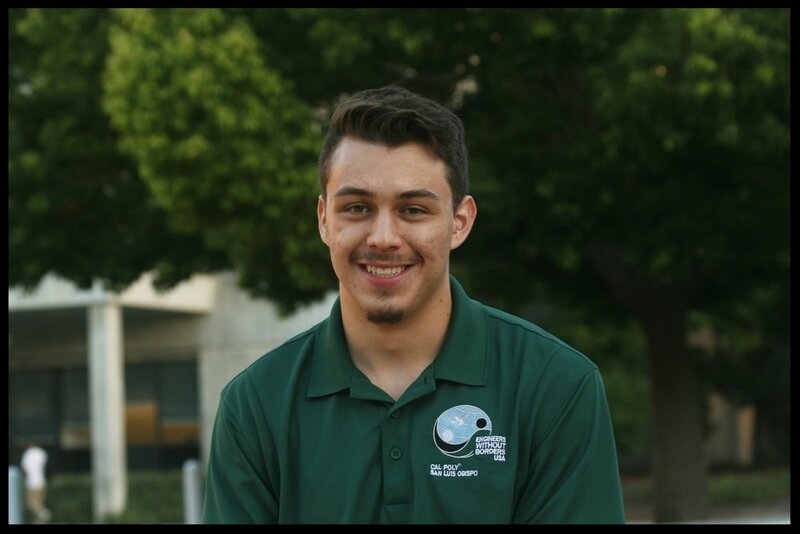 Michael Reyna is a second year Mechanical Engineer who joined EWB to find a group of people who share his goal of improving peoples' lives. He is a California native, born in Frenso. His favorite parts of EWB are hiking, beach bonfires, and camping trips with the rest of the team. In his spare time he enjoys hikes, visiting the beach, going stargazing, and playing board games. He is currently considering a career in global development or renewable energy. Abbie hails from Portland Oregon and is a coffee and outdoors enthusiast. She joined EWB because she wanted to get involved in a club that uses engineering skills to better the lives of others in a mindful, sustainable way. Her experience as an active member in EWB has been incredibly educational, fun, cultural, challenging, insightful, and so much more. Her favorite memory of implementing a water filtration project in her partnered community was working together to build the system cohesively, despite the language barrier separating them (ie. through the art of charades and many laughs). She is passionate about creating solutions to better our lives and the environment, and is pursuing a career in the engineering of high-sustainability buildings. Andrea is from San Diego, California. She first became interested in development when she witnessed the difference between the infrastructure and water quality in Tijuana versus that of San Diego, only a few miles away. Andrea joined Cal Poly's EWB to work with communities to attain the quality of life they deserve regardless of their geographic boundaries. Andrea is currently in the Nicaragua team as the Education lead, and her favorite part of EWB is working alongside some of the most passionate, humble, and hard-working people in Cal Poly. Brett Crews joined EWB in alignment with his interesting in helping make a difference in the world. He works as a design lead for the Nicaragua Team designing a distribution system. Travelling and spending time in Cuajachillo is his favorite memory with the club. When he isn't working on the project or school work he his biking and climbing in hopes of finding something that satisfies him as much as skiing, biking, and climbing in Colorado. Jasmine joined Engineers Without Borders because she wanted to get more involved on campus and loved that EWB could give her the opportunity to make a real difference in people’s lives. She is a member of Team Fiji and got the opportunity to travel with the team to complete their second assessment trip during Summer 2018. Her favorite memory from EWB was spending time in-country getting to know the community and experiencing their culture first hand. Jasmine grew up in Corona, CA (about an hour from LA), and some of her other hobbies include spending time outdoors, cooking, and hanging out with friends. Sheel is from Bristol, Wisconsin, and joined EWB to to utilize his engineering skills to help others and meet friends who are also passionate in engineering to make an impactful difference. He is a member of team Fiji, working often with the fundaising and solar teams. His favorite memories of EWB are the social events, such as the campouts, bonfires, or BBQs. Some of his hobbies include running, dancing, and photography & videography. Chris is from Los Angeles, CA. He joined EWB to gain engineering experience while aiding less-fortunate communities around the world. Chris's favorite EWB memory is of the first Officer Board retreat last spring. Outside of EWB, Chris works as an intramural volleyball ref and enjoys producing music. Brad Weeks is from San Diego, California. He spent much of his time in high school doing various local community service projects, and frequented Tijuana, Mexico to help build houses and facilities for the underprivileged. One of his passions is hobby electronics. This includes - Home networking, Audio-Circuitry design & construction, and Automation. His favorite part of EWB is working with the Local Projects team. Taylor strives to be a global citizen: to have a positive impact on her environment, community, and this planet. This led her to join EWB, and her favorite memory has been exploring the science-policy interface at United Nations forum in New York with fellow members. She loves to work with her hands, and her projects and experiences have inspired her interest in ethical and sustainable engagement and development. She grew up in Seattle, Washington and the surrounding landscape sparked her enthusiasm for outdoor education and environmental consciousness. Biking is her main form of transportation, and she can be found listening to a podcast, climbing, or attempting latte art. Alex is from San Jose and enjoys his experience with EWB. Last year he was the Thailand team fundraising sub-team lead, where he worked on two events that raised over $1000. This year he's looking forward to working on a higher level with the whole club. When school gives him time, Alex builds massive Rube Goldberg Machines and other chain reactions. Austin is from Novato, CA (Just north of San Francisco). He joined Engineers Without Boarders because he has a passion for both helping people, whether it's in our community or around the world, and working to find new solutions to technical problems. His favorite memory of EWB was having a successful turn out for the Fiji team's fundraiser partnering with the Line-Dancing Club. Outside of EWB, Austin enjoys photography, rock climbing, hiking, wake boarding, drawing, and exploring new places. Tim is originally from Santa Clara, CA. He joined EWB because he wanted a way to have an impact on the world and help people in need during his time in college. Two of his favorite EWB memories are volunteering for the Meade Canine Rescue Center as a part of the annual IMPACT weekend last year and attending the officer camping trip. Outside of EWB, he enjoys surfing, going to concerts, and brewing his own yerba mate in his free time. Sarah is from San Diego, CA and joined EWB due to her love for traveling and wanting to help people in need across the world using her engineering skills. Her favorite memory of EWB was planning and volunteering at IMPACT's volunteer weekend last year. She likes to run, do arts and crafts, and spend time outdoors. Her trip to Ecuador last summer gave her the opportunity to build with bamboo and inspired her to build sustainably in all her future projects. DJ’s hometown is Aliso Viejo, California. He originally joined EWB to play Ultimate Frisbee, but quickly fell in love with sustainable development as well as the impact we can have on local and international communities. One of his favorite things is to meet and work with people that are interested in getting involved with sustainability. His other passions include music production and watching excessive amounts of soccer. Zoe is a second year Mechanical Engineering student from Los Gatos, CA (Bay Area). She joined EWB because she wants to use her education to help others. Her favorite memory of EWB is going to Fiji, learning about the culture, living on island time, drinking out of coconuts and having an overall very successful second assessment trip. When Zoe isn't doing something for EWB, she loves to cook (roasted vegetables are her favorite! ), talk about going surfing but never going because she gets too cold and doesn't know how, and getting lost in the woods! Emma is passionate about advocating for sustainable and ethical development through her role as a Project Manager and officer of EWB. EWB has taken her to places like Mali Island in Fiji to a United Nations ST&I Forum in New York with lots of hard work and passion in between. She hopes to pursue a Master’s Degree in Civil & Environmental Engineering at Cal Poly with a focus on sustainable development practices in the WASH field. Outside of EWB, she enjoys camping, pursuing her Spanish minor, spending long days in Morro Bay, cooking, and participating in community events like Art After Dark. Maggie is from the suburbs of Chicago and lives in a small split-level with her parents, two brothers and sister, and a dog. She joined EWB because she wanted to apply her engineering knowledge and make a positive impact while doing it. Her favorite EWB memory is going on this past trip to the community; the team was really supportive and intelligent and she learned a lot about development. She knows how to knit and enjoys various other crafting endeavors and she plays the viola in the Cal Poly Symphony. Torrey is from San Diego, CA and she first joined EWB because she wanted to apply her skills to help others. After going to her first meeting, she realized how everyone in the club was so kind, friendly, and encouraging, and that EWB is a great place to learn about how to be a good "Global Citizen" and grow as a person. Her favorite memory of EWB was during her second trip to Malawi. Her team was drilling a borehole and after hours of drilling, they hit water and it was spraying everywhere. The community members were so excited, they were dancing and singing in the spray. When She’s not busy with EWB she enjoys being outdoors with her friends, running, swimming, backpacking, and more. Kyle is originally from Chico, California. He joined EWB at the beginning of his freshman year after hearing about one of his friends on campus from back home going to Nicaragua to build an elementary school. He soon became the Fundraising Lead for the Nicaragua team, then went on to be the Lead Fundraising Coordinator for the whole club, and is now one of the Project Managers of the Nicaragua team. His favorite memory with EWB is doing door-to-door surveys in his community, because he enjoyed getting the chance to hear about the community members' stories and views on local issues. For fun, he like skiing, mountain biking, hiking, rock climbing, and going to the beach. Dylan is from Folsom, California. He joined EWB as a way of uniting his passion for development work with his knowledge of Civil Engineering learned at Cal Poly. Dylan's favorite EWB memory is visiting La Rinconada and meeting the community members for the first time. Outside of EWB, Dylan enjoys playing soccer, hiking, and camping. From Carbondale, Colorado, Ruby joined EWB because she wanted to make a difference in the world. Her first trip to Thailand was her favorite EWB memory. The whole trip. She loves to ski, hike, camp, and anything outside. When she’s not doing school or EWB, she tries to be outside with her puppy Mabel. Cole is from Escondido, CA. He joined EWB right when he came to Poly because he was interested in the applied travel experience that this group offers. Making ground pepper powder with the headman of Pa Kloi is one of my favorite memories ever.